BURBANK, Calif.—NOV. 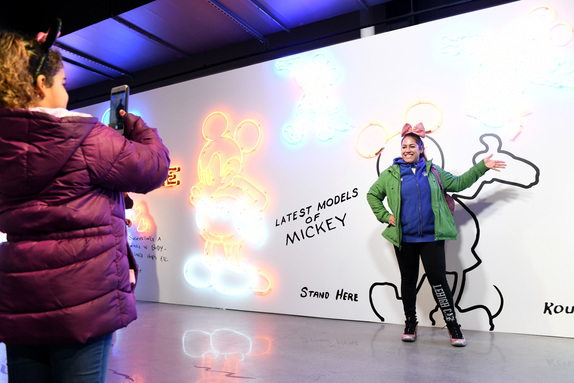 8, 2018— Today, Disney officially opened “Mickey: The True Original Exhibition” in New York City’s Meatpacking District, welcoming guests from around the globe to the 16,000 square-foot immersive pop-up celebrating the 90th anniversary of Mickey Mouse. Haring’s drawing, Untitled (Mickey Mouse), 1981, is accompanied by a hand-selected assortment of original photos of the artist alongside some of his most famous Mickey Mouse pieces, captured by his close friend and photographer Tseng Kwong Chi, throughout his career in the 1980’s. The portraits of the two friends, who bonded over a shared love of pop culture and icons, are showcased together for the first time in this exhibition. All of the original and historic pieces are featured throughout more than a dozen thematic rooms, each carefully curated and artfully designed to highlight a chapter of Mickey Mouse’s story. 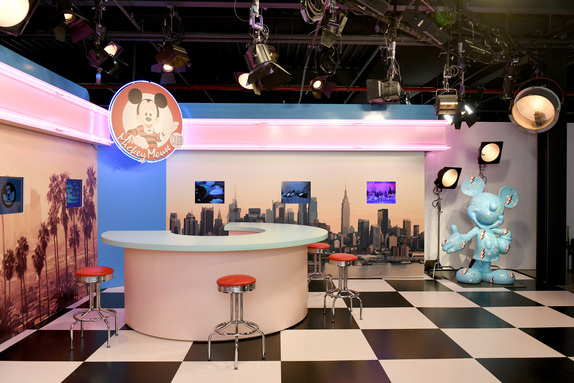 Along the way, guests will discover larger-than-life photo moments, including a replica of Steamboat Willie’s vessel, black-and-white immersive scenes from classic cartoon shorts, a transformative reinterpretation of The Sorcerer’s Apprentice from Walt Disney’s masterpiece film, Fantasia, and a recreation of the 1990’s All New Mickey Mouse Club set. Original Muse- Showcases how Mickey has inspired artists around the world to create, reinterpret, and reimagine. Featured artists: Keith Haring, Tseng Kwong Chi, James Jean, Keiichi Tanaami, Tanya Aguiniga, PEACEMINUSONE, Javier Sanchez Medina, Tetsuya Nomura, and Oliver Payne. The Collection- Illustrates how tactile, functional works of art brings Mickey into fans’ everyday lives. Featured artists: Darren Romanelli aka DRx and Shinique Smith. Within the experience, ‘Mickey’s Maker Shop’ is a retail store offering exhibition-branded merchandise, select pieces from 90 th anniversary ‘True Original’ Mickey Mouse capsule collections and custom products that can be personalized on-site. Fans can also shop limited-edition merchandise through timed product drops throughout the exhibition run. The shop is open to the public; exhibition tickets are not required for entry. Select exhibtion and Mickey 90 th merchandise can also be purchased on shopDisney. Exhibition sponsors have created interactive activations that engage guests of all ages. With the help ofGoogle Home, attendees can join in a special game show with Mickey Mouse and his friends. Following the announce of Beats Solo3 Wireless Headphones – Mickey Mouse’s 90th Anniversary Edition, Beats will continue to celebrate Mickey and his influence on music with listening stations and a photo gallery in the Exhibition lounge. Finally, Brooklyn-based and family-owned ice cream maker Ample Hills Creamery will share complimentary scoops of birthday cake ice cream from their Disney Mickey Mouse Collection. 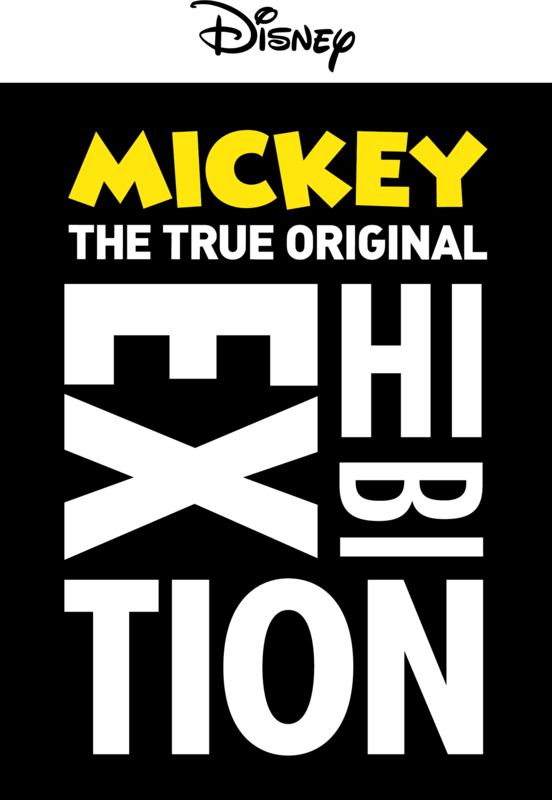 Running from November 8, 2018 – February 10, 2019, ‘Mickey: The True Original Exhibition’ will be open Tuesday-Sunday from 10 a.m. to 8 p.m. at 60 10th Avenue, New York. Tickets are available for $38 per person at Disney.com/MickeyTrueOriginal. With selected time slots already selling out for its November debut, guests are encouraged to plan early. The exhibition is not open on Thanksgiving, Christmas or New Years. Since his big-screen debut in Steamboat Willie on November 18, 1928, Mickey has become the global ambassador for The Walt Disney Company. The 90-year celebration of Mickey includes new brand and product collaborations spanning fashion, food, consumer electronics, toys, accessories and more.